Published: May 23, 2013 at 09:55 a.m. Updated: May 31, 2013 at 02:58 p.m. This is the age of the young quarterback. Buoyed by the draft class of 2012, we have a surplus of promising young signal-callers. 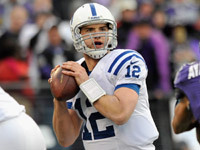 Around The League and "NFL Total Access" counted down the top 10 quarterbacks 25 or under. 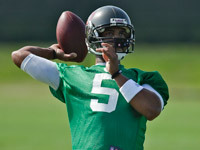 Josh Freeman has a lot to prove to Tampa Bay Buccaneers coach Greg Schiano. But after watching tape, Gregg Rosenthal placed Freeman on his list of top 10 quarterbacks 25 or under. 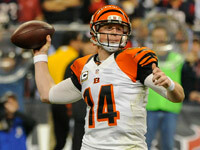 Andy Dalton has taken the Cincinnati Bengals to the playoffs twice in two seasons. That earns him a spot on Gregg Rosenthal's list of top 10 QBs 25 or under, but Dalton is far from a finished product. Sam Bradford has the pedigree of a No. 1 draft pick but the numbers of a below-average starter. 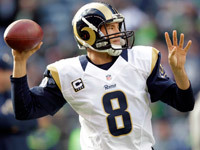 So where will the St. Louis Rams quarterback's career go from here? Gregg Rosenthal examines. Ryan Tannehill was overshadowed by Robert Griffin III, Andrew Luck and Russell Wilson during his rookie season. 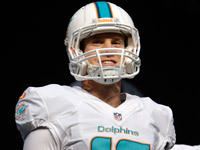 But Gregg Rosenthal says Tannehill has the potential to be as good as any of them. Matthew Stafford has averaged 5,000 yards over the last two seasons. So why he did take such a big step back in 2012? 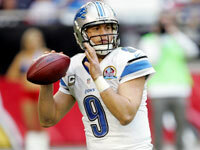 Gregg Rosenthal examines if Stafford will ever rise to the top of the QB heap. Russell Wilson's incredible rookie year was overshadowed by Robert Griffin III and Andrew Luck. But Gregg Rosenthal says Wilson has the potential to be as good as either of them. Cam Newton was THE young quarterback to watch in 2011. Now he's just one of many. Gregg Rosenthal breaks down why Newton could be the most fascinating one to watch in the next five years. 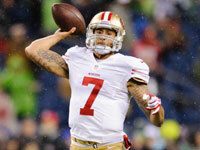 A year ago, Colin Kaepernick was an intriguing, largely unknown backup quarterback for the San Francisco 49ers. Now he could be the most talented young QB in the NFL. Where will his career go? Before his ACL injury, Robert Griffin III authored one of the greatest rookie seasons in NFL history. 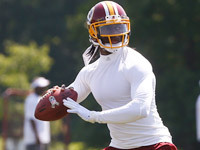 So where does the young Washington Redskins quarterback go from here? No young quarterback completed more "wow" plays than Andrew Luck last year. Asked to do more than any of his counterparts in the league last year, the Indianapolis Colts' signal-caller responded.